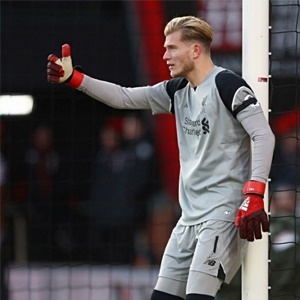 Liverpool - Liverpool goalkeeper Loris Karius has said he has no qualms battling for his place with Simon Mignolet as part of Reds manager Jurgen Klopp's rotation policy. Karius started Liverpool's 2-2 draw against Sevilla in the Champions League on Wednesday ahead of Belgium international Mignolet. Klopp's decision to change goalkeepers on a regular basis rather than stick with an established number one has proved controversial, but German compatriot Karius is eager to take any chance to impress. "It's an interesting situation with three good goalkeepers, which can only be good for the club," Karius said ahead of Liverpool's Premier League clash with Burnley on Saturday. "We try to do our best every single day in training and in the games. I'm happy I got to play against Sevilla. "I'm hoping I get more games, of course. I try to prepare well in training and then be ready when I'm called upon." Karius added: "It's up to the manager anyway, you don't decide yourself as a player. All you can do is concentrate on your work and that's what I've done. "I had a little setback in pre-season with an injury that took me out for a week or so, but I try to train well, stay focused and that's all you can do." Liverpool created plenty of chances against Sevilla but were guilty of poor finishing and Klopp said his players must be more clinical against Burnley. "We know we have to improve on this," the manager said. "But it's not an illness that you can change it. We will work on this like we work on other parts of our game, for sure." Liverpool will be without winger Sadio Mane as he serves the first match of a three-game suspension following his sending off against Manchester City last Saturday. Brazil attacking midfielder Philippe Coutinho came off the bench against Sevilla and could make his first Premier League start of the season against the Clarets having missed the early part of the campaign with a back injury amid speculation regarding a transfer to Barcelona. Midfielder Adam Lallana (thigh) and defender Nathaniel Clyne (back) remain long-term absentees. Meanwhile Burnley manager Sean Dyche has backed reserve goalkeeper Nick Pope to fill the boots of Tom Heaton after the England international underwent surgery on a dislocated shoulder. Heaton, 31, is set to be missing for around four months after he sustained the blow in Burnley's 1-0 win over Crystal Palace last weekend and Pope will start at Anfield. "It's hard for some players who have to sit behind players," Dyche said. "They should be developing within the group anyway and then they are ready to come in. Nick is a great example of that. "He has been working with some top-class 'keepers. He has been improving all the time. He did well against Palace and now he has a chance to show what he can do. That's a great opportunity." Burnley midfielder Jeff Hendrick faces a late fitness test, having returned to training after a thigh problem.